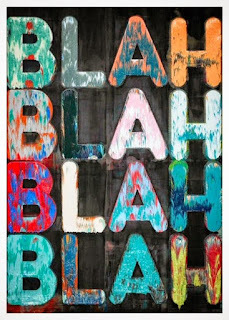 In Alzheimer's World if you use too many words all you are really saying is Blah, Blah, Blah - Blah Blah. One of the hardest things to do as an Alzheimer's caregiver is learning how to understand, cope, and communicate with a person living with dementia. Learning how to communicate effectively with a person living with dementia requires change. How hard is it to change the way you have been doing things with a person you have known all of your life? Hard! My point, you cannot keep doing it the way you have in the past. You have to learn a new way to reconnect. The bottom line here. Beyond a certain stage in the progression of Alzheimer's, communicating in the same way we have all our lives will not work well with a person living with dementia. When the brain's hippocampus stops working properly, new memories no longer get converted and stored in the brain of a person living with dementia. Think about it. By the time I stopped trying to explain to Dotty why she would enjoy doing something, or why she shouldn't be thinking the way she was thinking, I doubt she had a clue what I was talking about. By the time I got to the last words, she could no longer remember my first words. In other words, everything I was saying failed to compute, failed to communicate. It finally occurred to me that when I said too many words my mother would get confused, or frustrated, or even angry. Once I made it to Alzheimer's World (formerly Dotty's World) I started paying attention to my mother. I payed attention to the look on my mother's face. If I was saying something nice and she had the wrong look on her face, in other words like I was saying something mean, then I was failing to communicate effectively. Now, I could have blamed her, don't we all? But instead I started blaming me. If you stay in the real world all the time and continue to communicate as if the person living with dementia is right there with you, it won't work well, and it might not work at all. My problem was simple. I understood that Alzheimer's was ravaging my mother's brain, and I understood that much of her erratic and challenging behavior was being caused by Alzheimer's, but when I was operating in the real world I just couldn't switch gears. In the real world I would get angry, frustrated, confused, and often bent out of shape. This ever happen to you? The real problem was in my own brain. I had been doing things a certain way my entire life in the real world, and the way I was doing things worked just fine. In this case, however, my brain would not adjust to Alzheimer's. So I made this new place in my brain - Alzheimer's World. I physically made my giant step to the left to signal my brain that we were going in - into Alzheimer's World. The step to the left was more or less the switch. Like a train switching tracks. I had to throw the switch in my brain before I could adapt. Eventually, I realized I was drowning my mother with too many words, I decided that I needed to say as few words as possible. Interestingly, this led to greater use of nonverbal communication. Sometimes I didn't need to say anything. Ever tried that? Sometimes all I needed to do was smile. Sometimes all I had to do was stick out my hand, and let my mother take it. Sometimes I just put my arm around her shoulder and my head on her head. For example. Instead of a long explanation of what we were going to do, I stuck out my hand and said let's go. Amazingly she took my hand and started moving even before she asked, where are we going? Instead of explaining where we were going, I smiled and said, to have fun. Little did she know that I was the one that was going to have the most fun after she took a pee without a fight about it. One of the best things I learned was how to meet meanness with kindness and nonverbal communication. When my mother would say, "get out, I don't want you here, I can take care of myself". Instead of getting all bent out of shape, I took my giant step to the left. I reminded my brain we were going into Alzheimer's World - I threw the switch. Once in AW instead of being mean right back at my mother I did the opposite of what my real world brain told me to do. The exact opposite. I smiled, waited for the eye contact, and then went over, put my arm my mother's shoulder, put my head on her head, and told her, "I'm here, I am not going anywhere, and I am taking care of you". I held on and kept my mouth shut. Ever tried that? Instead of running into her bedroom and whimpering after she said something mean to me and I overreacted, my mother seemed to calm down. I was very calm because I learned over time that less words and better nonverbal communication lead to less pain and more happiness. For both of us. By the way, I know it worked because my mother stopped telling me "to get out". And better yet, we had reinstated the bond we had before AD. In case you didn't already notice here on the ARR I am a man of many words. But in Alzheimer's World I learned that the Blah Blah Blah lead to heart ache and emotional pain. If you say too many words it is likely that the Alzheimer's patients will forget what you are talking about before you get to your point. Long explanations don't work. Long defenses of yourself don't work. Smiles, hugs, and things like touching hands do work. Well, for one reason the Alzheimer's patients continue to understand what these nonverbal messages mean. They understand this because the information was stored in their brain a long time ago. It was stored in the brain before the hippocampus stopped working effectively. Forget the Blah Blah Blah. Take a step to the left. Leave the burden behind. Don't be afraid or reluctant to step into this new and very different world. In Alzheimer's World, reality takes on a different shape. Reality in Alzheimer's World is a reflection of what the person living with Alzheimer's thinks and believes. It is this reality that you must focus on, not the way YOU think things are, or should be. I feel confident when I say this -- you won't be able to convince a person who is deeply forgetful that they are wrong, and you won't be able to convince them that your reality is the true reality. They can't remember like you or me, so they really cannot comprehend your point of view. When you do this you are asking the person who is deeply forgetful to come back into your world. They cannot do this. Two of the biggest problems Alzheimer's and Dementia caregivers face are how to cope and communicate with someone living with dementia. The Alzheimer's caregiver deals with a disease and behaviors that are difficult, sometimes impossible, to understand. Alzheimer's disease turns the world of the Alzheimer's caregiver upside down. Imagine a person you know all, or most, of your life and their behavior changes-- suddenly -- and for the worse. This person, your loved one, begins to act out behaviors that you have never seen or experienced. You are forced to try and deal with these behaviors. It is not easy. Not easy unless you begin to put these behaviors in the proper context. Is the Alzheimer's patient being intentionally mean? Or, is the meanness caused by illness -- Alzheimer's disease. When an Alzheimer's caregiver hears something that is mean or nasty they usually react in anger. This is a normal behavior -- the "norm". Using these behaviors that you have developed over the course of your life help you cope. This is the way you have been coping your entire life. No one wants to be treated harshly. The typical Alzheimer's caregiver is bombarded with mean spirited behavior over and over. Since the caregiver is made of flesh and blood they often feel angry, frustrated, and sad when it happens. There is nothing wrong with these kinds of feelings. This is the "norm". Typically, an Alzheimer's caregivers decides to strike back in the form of an argument, or an equally harsh behavior. Soon the caregiver learns that this only makes matters worse. The "strike back" makes the Alzheimer's patient meaner or sometimes sends them into a "shell". It is not unusual for an Alzheimer's patient to deny they said anything mean. They don't remember saying it. Its part of the disease. A person that has Alzheimer's diseases loses the ability to forgive, apologize, or make-up. The words, actions, and behaviors of the Alzheimer's patient are a product of the disease. These mean spirited words and behaviors are rarely if ever a product of intentional thought (as we know it). Alzheimer's Reading Room. Bob DeMarco. February, 2013. At its core the Alzheimer's Reading Room is about helping members of the Alzheimer's Community understand, cope, and communicate with persons living with dementia.